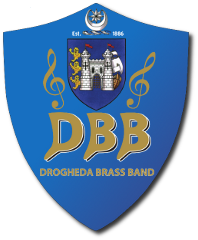 The Drogheda Brass Band is the official band for the town of Drogheda and one of only a handful of organisations permitted to use the town's official crest. Drogheda has an extremely rich history and we're very proud to represent the town and its surrounding areas. Drogheda is located 30 miles north of Dublin and 70 miles south of Belfast. Getting here is easy, as Drogheda is only 20 minutes from Dublin Airport, and less than 2 hours from Belfast. A first class modern transport network linking Dublin with Belfast passes directly through Drogheda. Getting here by car, bus or train is easy. Our bandroom is located on the south side of Drogheda, near the M1 motorway and just a 5 minute drive from the town centre.